I have no idea what kind of tea you got, but it sure does look wonderful. I have to laugh that 1/2 t. chili powder is too spicy for you! My mom is the same way, even after 50 years here in Texas. I'm sure your soup is delicious. I know I don't have Texas taste buds, but when I use chili powder I usually measure it by tablespoons and keep adding more and more. But the chipotle powder I have is really hot. It adds a lot of fire along with the flavor and I guess I need a little Texas blood to fully appreciate it! My first thought on the tea was chrysanthemum. There are also other different dried flower teas. Jasmine. Lotus. Lily. 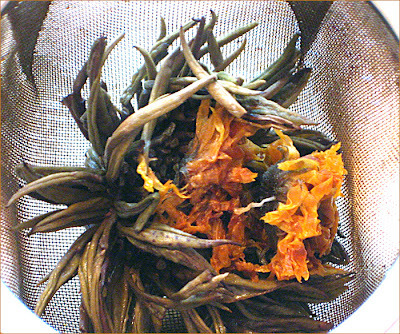 Go to google images and enter 'chinese flower tea' to see if you spot yours. I don't know why that popped into my head. I've never actually seen or tried any of these. Agnes, my first thought was chrysanthemum and my second was jasmine. I don't really know which it is. I followed your suggestion and found pictures of "magic Chinese flower tea" that looked just like the tightly wound balls of tea we have. Thanks! I've never seen this tea before. I just found your blog and I am loving it. 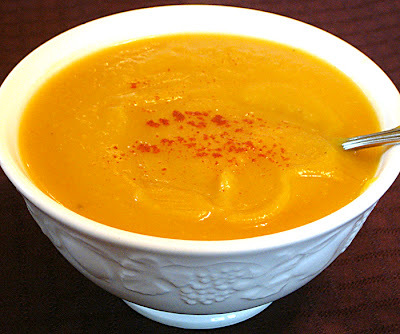 As a lover of all things spicy and all things squash, this soup has me sold. I am going to take this recipe down and add it to my insane list of recipes I want to try. Have I mentioned that I ADORE chipotle chili powder? Mmmmm. The jasmine balls are delicious. They can be made with either white or green tea and are then infused with jasmine. The soup sounds great. Usually I make mine gingery but I like the sound of this one. Wow Jordan was right--this is the best soup EVER! Creamy and spicy all in one bite. We used Kabocha squash and it was yummmm. I do have to say, however, that it was WAY more work than the butternut squash lasagna. I had never tried to pressure cook a squash before, and I thought I followed your directions, but when I opened it up a lot of the skin had broken off and it was hard to pick it out. Nonetheless, it was very tasty. THANKS! Andrea, thanks for commenting on my Hummus Heat with Pitas & Vegetables. Can you tell what recipe of yours I was attracted to immediately - this wonderful soup with chipotle. It sounds sooo good! I'm not much of a soup person, but I decided to give this one a try. I made it last night. I don't have a pressure cooker, so I boiled the squash chunks for about 15 minutes. I also used less onion, because I'm not a big fan of onion. And I didn't have truffle oil, so I just used more olive oil. To sum up, it tastes great. It is definitely spicy. It turned out VERY thick, more like mashed potatoes than soup, so I added some broth to try and thin it out, which helped some, but it's still so thick that it doesn't really seem like a soup to me. All in all though, very tasty. I wish I'd had truffle oil, so I could see how that affects the flavor, and next time I'd probably use less chipotle powder, because seriously, HOT.